Happiest of Thanksgivings to You and Yours from Bill Windsor and Lawless America. I'll be all alone this Thanksgiving. I'll venture out in search of turkey about noon, but it will be a quiet day of trial preparation and Texas Tech football. I used to have a family and enjoyed many wonderful Thanksgivings with my former children and my very special granddaughters, but fighting corruption took that away from me. On October 28, 2014, I was in the 40th Judicial District Court in Waxahachie Texas for a hearing in civil case #88611 (William M. Windsor v. Joeyisalittlekid, et al). I was surprised to see Ellis County District Attorney Patrick Wilson and Ellis County Texas Sheriff Johnny Brown in the audience for the hearing as well as a small army of Ellis County Sheriff’s deputies. The hearing lasted from 1:30 pm to a little after 5:00 pm. It was the last hearing of the day, and it had nothing to do with the DA or the Sheriff. I was detained on October 28, 2014 at approximately 5:30 pm by the Ellis County Sheriff’s Department as I left the courtroom. I was informed that there was a warrant from Montana. I was taken to the Ellis County Jail. I was not given any paperwork or explanation as to why I was there. My personal property was taken from me. I had never been in jail, never charged with a crime, not even a traffic ticket or parking ticket in 15 years. I was told that I had been granted a $100,000 bond and was given the opportunity to post bond for “violations of a protective order.” No details were given. I am EXTREMELY claustrophobic, and the first two days were terrifying in that regard. I seriously questioned whether I could make it. I take medication nightly for claustrophobia, but I had no medicine with me, and speaking to an Ellis County Texas Jail staff member is like talking to a stump. At 2:00 am on October 29, 2014, I was given a telephone call by Officer Jerri Smith. It was too late to reach anyone, and the telephones at the Ellis County Texas jail do not allow a message to be left on voice mail. I knew only two phone numbers – my former son and a woman I used to live with (who claims to be my ex-wife). I called them at least a dozen times each over the next three days. Neither of them ever accepted my calls, and they never did anything to help me. So much for so-called “family.” The feeling of being completely alone is a feeling that I hope I never experience again. While I was told that my bond was set at $100,000, when I got bail bond companies to provide the bond, the Ellis County Jail refused to accept it. I was then moved from the Booking Area to “O” Tank in the Ellis County Jail at about 4:00 pm on October 30, 2014. While in Booking, I was exposed to staph and MRSA as well as one extremely violent crazy man. I was really apprehensive about moving into "population." “O” Tank is a 24-man cell of approximately 1,500 square feet; 12 double bunks, three 8-seat iron picnic-style tables, three toilets, three sinks, two showers, cement block walls, cement floor, steel ceiling, bulletproof glass windows to the guard area, not bars. I immediately met Thomas Joe Edward Lee aka T.J. and several other young men, and I was relieved and felt comfortable. It was not scary as I anticipated. I never met anyone older than me, and 95% of the men there could have been my children or grandchildren. I’d estimate the average age to be 28. Other new friends made the first day in “O” Tank at the Ellis County Jail included Marquavius Woods (the only person other than me who I met out of hundreds who did not have tattoos); Jonathan Rima (a nice young man on crutches); Bryan (a tall guy who traded his semi-lumpy mattress for my giant lumps mattress); Michael McGowan (a handicapped black man who had been unable to obtain any help from his court-appointed attorney); Ignacio Galvan aka Nacho (nicknamed me Montana and “hazed” me the first night by saying the newest guy had to get up and turn out the lights – and there is no switch and the lights are always on); Zach (a really nice trustee with a hearing loss similar to mine); and Robert Davidson aka Jake or The Vape Master (a young guy who fell behind on court payments and got his probation revoked as a result). I found that older men command almost universal respect in jail/prison. In addition to “Montana,” I was nicknamed Old School or School, for short. This is a common prison term for anyone seen as quite a bit older than you. That meant I was “School” to everyone. I later learned that “Pops” and “PawPaw” are also common. It seems that most people in jail must have called their grandfathers “PawPaw,” because I was called PawPaw a lot. As miserable as the experience was, I really did meet wonderful people. I cannot imagine what it would have been like without such kind people who immediately had my back, my front, and my sides. I was taken care of the whole time I was there as if I was actually the PawPaw to these guys. I was especially relieved to see how open the tank was as that really lessened the claustrophobia. My claustrophobia is so bad that I can’t even watch a movie where someone is in a small, restricted space. 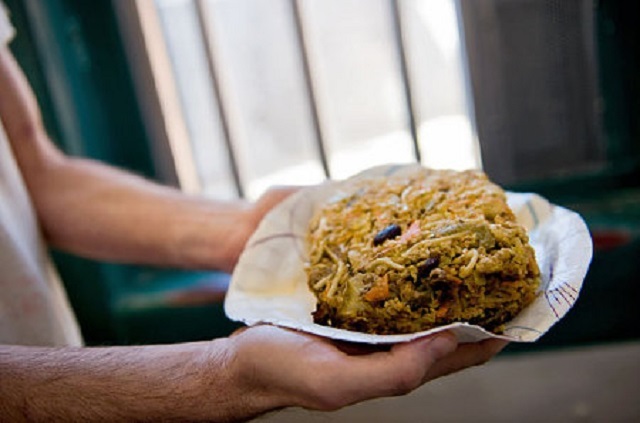 My first jail meal other than bologna sandwiches served in a paper sack (“Johnny Sack”) in Booking was something that faintly resembled hamburger meat, two slices of bread, broccoli stems, two cookies, and a would-be Kool-Aid. I scarfed it down. I was so upset for the three days in Booking that I hadn’t eaten. It may be hard for those who have never experienced this, but I made really good friends in jail with men and boys with whom I seemingly had very little in common. I found most of my fellow inmates to be extremely kind, very honest, and thankful for the smallest of gestures. Most of my fellow inmates had little or absolutely NO money on their books. They couldn't even buy a cracker. Some men are lucky enough to have money on their books, so they can buy all kinds of things from the Commissary Lady. It saddened me to see the guys with no money. It had to be really hard on them to see what other guys were enjoying. I had money. I ended up giving away half of what I bought. The hottest Commissary item is called "soups" by the inmates. They are actually Ramen Noodle packages. They come in an array of flavors (usually very spicy), and soups are the #1 commodity behind bars. Sold by the Commissary Lady for 99 cents, a soup is an inexpensive meal for men who never got filled from the jail-sized servings at breakfast, lunch, and dinner. Hot water is used to cook the soups. And the many jailhouse chefs have concocted a wide variety of recipes for their soups. They use items saved from dinner or purchased from the Commissary. The fancier, multiple inmate meals are called "spreads." 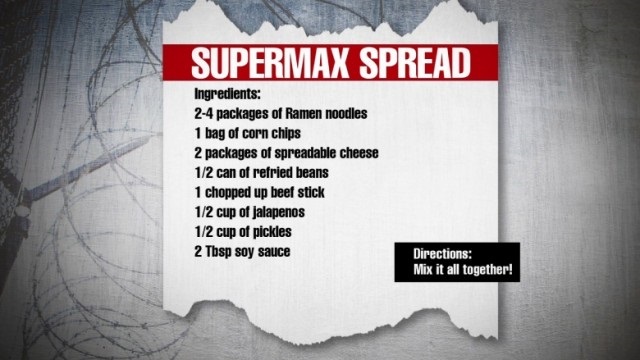 This is a fairly typical recipe for a Jail Spread -- but much more spicy in Texas. I'm not a cook, so when I enjoyed a soup, someone else did the cooking. I enjoyed a basic soup with beans, chili or tuna added. I enjoyed soup-based burritos, and best of all I enjoyed soup pizza. The pizza makers would get the spread participants to save their hot dogs at dinner and they cut them up as makeshift pepperonis. 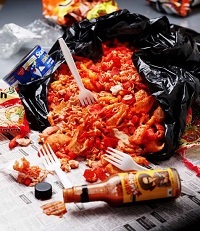 There is no end to the ultra-spicy commissary items, so the pizza could include anything from jalapeno Cheetos or spicy chili Fritos to real jalapenos, fire-alarm chili, spicy pickles and more. 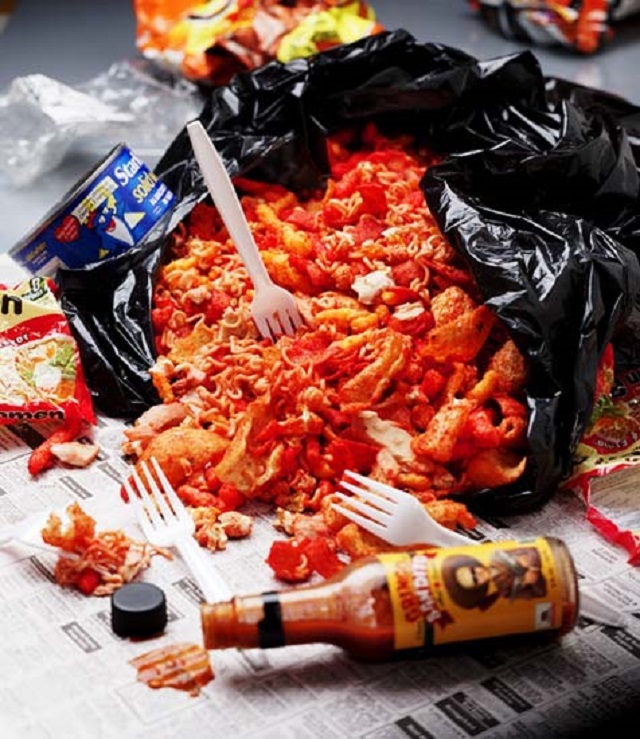 The cooking consists of hot water in a plastic bag, salvaged from some Commissary item or rescued before it hit a trash pile. The goop is mixed with hot water in the plastic bag, then covered with cardboard from the back of a legal pad and bath towels - all to keep the heat in. Served with a side order of saltine crackers (99 cents for a full sleeve), these soups and spreads are surprisingly good. Claxton made a tuna spread for us in the Ellis County Texas Jail that remains my absolute favorite! It is amazing what you can convince yourself is good when you have little or nothing. As Thanksgiving 2014 drew nearer, I learned that the Thanksgiving meal in the Ellis County Texas Jail is not very big or very good. I thought it would be great to do something for my fellow convicts, so I arranged for someone on the outside to put $50 on the books of four of my fellow prisoners. We then ordered $200 worth of the Commissary Lady's finest spicy foods, soups, crackers, and the like so we could put together a huge Thanksgiving Spread. I swear it looks a lot better to you in jail when you don't have as much as you'd like to eat! I wanted to keep my involvement a secret, but one or more of my helpers couldn't help but blab, and everyone found out that I was responsible for the extra meal that we all enjoyed on Thanksgiving Day 2014. You would have thought I had given them each a million dollars. The men were SO appreciative. Most of them had probably never experiened a random act of kindness. We laughed and talked and ate, and a good time was had by all. 24 boys and men, all stuck in a place that none of us wanted to be. Most were guilty of drinking too much, using drugs, or being poor. All were victims of broken systems. It may seem strange that my favorite Thanksgiving of all times will be Thanksgiving 2014 with 23 fellow prisoners, but I cannot imagine anything could ever top it. I am thankful for every boy and man I met in jail, thankful for their friendship, thankful for what I learned from them, and thankful that I can now crusade against the many wrongs of our broken penal system. If you have a friend or relative in jail, I encourage you to put some money on their books. It will mean the world to them! It is better to give than to receive. Happy Thanksgiving! I know that some of the guys are out and will read this article, so I cannot fail to mention my other friends from the Ellis County Jail in Waxahachie, Texas. These friends include Carlos Amador aka Paradise, Zachary Anderson, Cody Barnes, James Boyette aka The Boxer, David Bradshaw, Steven Calder aka The Enforcer, Lejonathan Cox, Greg Deloach, Cristoval Diaz, Brian Eaton, Michael Finch, Julian Fira, Donald Ford, Francisco Garcia, Justin Garcia aka Houston, Arcadio Garza, Michael Gonzales, Lonnie Hall, Michael Harvey, Robert Holland, Chris Horn, Robert Jack, Aaron Jones aka AJ or Lover Boy, Zackery Jones aka Locker, Greg Mason, Billy Mizer, Faustino Montemayor aka Claxton, James Myers aka Cellie, Heath Neitzel, Nicholas Parker, Eugenio Pena aka The Barber, Lonny Ramirez, Matthew Rauen, Bobby Rhodes aka Tank Boss, Benton Skelton, Louis Stocker aka Organized, Amber Vanderzwart, Gustavo Villanueva, Hector Villanueva. This does not include those who have been released or sent to The Big House, including Jacob Aparicio, Justin Johnston, John Florence, Jamie Ellis, Jordan Brittain, De'Juan Wilson, Aaron Drake, Terrance Marion, Drake Hernandez, Lawrence Murley, Scotty Stewart. A Thanksgiving tradition for Windsors has included having everyone write down what they are thankful for. This is what my Dad wrote. I am thankful for my Jailhouse and Lawless America Friends, my new family. I will be announcing a special filming after the trial in Missoula. I want to try to get as many victims as possible to come to the trial. Then we will film a group session followed by filming of individual stories. So, if you are in Montana or have friends there, please ask them to participate. Bill Windsor has been suspended from Facebook for 30 days for publishing something that he didn't publish. So, for all the news, come here. For a quick update on Bill Windsor's saga and his trial, see this summary on LawlessAmerica.com.